I awoke this morning feeling like hadn't rested at all. Do you ever have nights like that? The bed was a mess and I realized I'd been sleeping underneath the fitted sheet on top of the mattress pad. The bed looked like I had been wrestling with an angel--or a demon--I know not which. But I do know that I wanted to crawl back into bed and have another go at seven to eight hours. Alas, life this morning did not afford that opportunity. Duty calls. So do the bills. Work is necessary because I like to eat. 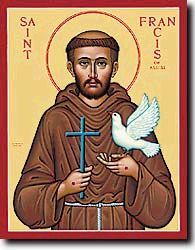 I arrived at my desk and glanced up at the Prayer of St. Francis. I keep copies of it available to clients who are seeking guidance in the form of prayer. My narcissism seeks to make it all about me: my rights, my needs, my wants, my opinions, my hurts, my pain, me, me, me. I recognize the deep hunger of my ego will never be satisified when I hyperfocus on me. Eckhart Tolle in his teachings calls it the pain body. St. Paul called it the flesh. I call it most annoying. But it's there, and I can't deny it. So today I remind myself that as I give, I diminish selfishness in my life. As I help, I receive the aid I need. As I pardon, I receive forgivness for my wrongs. As I seek to understand, I find empathy and understanding. As I love, I receive the care and affection that comes from above. As I die to me, I truly live. And then I find rest for my soul even when the sheets on the bed bespeak an alternate experience. By the way, I did make the bed before leaving for work. A messy bed does not determine the tenor of my day. Hopefully, my ego won't either. I'm in birthday celebration mode. For about a week actually. That's the beauty of having your birthday near midweek, you celebrate before and after the big day. Last year I went to dinner with friends and had another dinner with family. I turned 40 and wanted a big celebration. That didn't happen. But this year it did. I turned 40 this past week. Yep, the big 4-0. I've lived a biblical generation, sometimes to biblical proportions.